WASHINGTON, DC, September 17, 2012 (ENS) – Polluted with raw sewage and industrial waste, the Guaire River in Venezuela’s capital city, Caracas, is to be cleaned with a loan of US$300 million from the Inter-American Development Bank. A separate loan of $100 million will enable improved water quality management in communities of 5,000 to 500,000 inhabitants across Venezuela. The IDB approved the two loans last week. The Government of Venezuela will provide counterpart funding of $70 million for the Guaire River sanitation project and $42 million for the water quality management project. The loans come as President Hugo Chavez is seeking a new six-year term in an October 7 election in a race against business-friendly candidate Henrique Capriles. 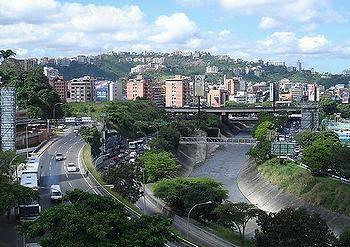 The Guaire River is the main body of water in Caracas. Once relatively large but now reduced in volume and polluted by domestic sewage and industrial wastewater, it flows across the city and empties into the Tuy River, which flows to the Caribbean Sea. Over the next four years, the Guaire River clean-up program is expected construct and rehabilitate more than 90 kilometers of wastewater collectors, build a pumping station in San Pedro, construct 19 sediment retention and flood prevention structures and carry out 22 works for socio-environmental refurbishment and restoration. The IDB loan will fund works in 12 subbasins of the Guaire River that will collect, channel, separate, and dispose of sewage. “As a result of these development works, the percentage of sewage and waste managed in the 12 subbasins is expected to increase to almost 90 percent,” said Rudi Luis Cressa, Inter-American Development Bank team leader. The project’s goal is to provide sewerage and treatment services for the citizens of the Caracas metropolitan area to improve their living standards and the quality of local water resources. The project will also support socio-environmental initiatives to prevent and reduce vulnerability of surrounding communities to flooding and landslides. In September 2010, for instance, heavy rains caused floodwaters from the Guaire River to enter a Caracas home and sweep a family away, killing seven people. 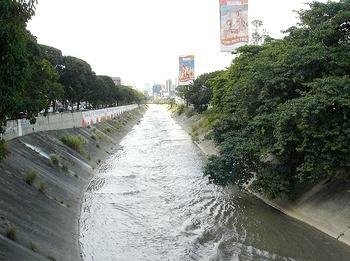 Studies have shown that in the Caracas metropolitan area, inhabited by nearly seven million people, over 80 percent of sewage is discharged into streams in the Guaire River’s 32 subbasins. High-income Caracas families live in urbanized areas with adequate sanitation services, but low-income families live in informal settlements with no access to basic sanitation services. There have been no regulations for the monitoring of pathogenic viruses in waters in Venezuela such as those that have existed among European countries and in the United States. To remedy these conditions, sewage systems will be constructed along with infrastructure for collecting, transporting, separating, and discharging sewage in the subbasins of the Guaire River. Then sewage treatment plants are scheduled for construction between the start of 2014 and early 2015. The project to improve water quality management will focus on the rehabilitation and/or expansion of operational infrastructure in water treatment plants and laboratories as well as measures to strengthen the management of potable water service in the areas of operation, maintenance, and quality control. “This project will help to improve the quality of life for many families living in small and medium-sized cities,” said Cressa. The project will benefit some 1.4 million inhabitants of towns and cities of between 5,000 and 500,000 population. The project aims to rehabilitate and/or expand 18 water treatment plants, equip and place into service 40 quality control laboratories in different regions of the country, and carry out 70 training workshops in the areas of operation, maintenance, and quality control of water treatment plants. The bank said the two loans will contribute to Venezuela’s strategy to maintain and improve potable water access and quality of drinking water and provide sanitation for all its population.